Now Foods NADH is a dietary supplement containing 10mg of reduced nicotinamide adenine dinucleotide (NADH) and 200 mg of D-Ribose. Reduced nicotinamide adenine dinucleotide (NADH) – a niacin derivative, is a coenzyme present in all living cells. It plays a role of a cofactor for hundreds of important biochemical reactions in the organism. It plays a major role in the process of ATP production and neurotransmitters synthesis. In the organism it may be transformed into NADPH and oxidized ions NAD+ and NADP+. D-Ribose – a five-carbon simple sugar belonging to aldoses. It constitutes a structural element for, among others, ATP, NAD and RNA. NADH fulfills a major role in the process of obtaining energy from burned energy substrates. NADH during oxygenation to NAD+ inside the mitochondrial membrane releases two electrons and a hydrogen atom. The energy released in this reaction is transformed to ATP with the use of ATP synthase enzyme. The effect of the growth of energy molecules is intensified by the presence of d-ribose, which constitutes a “skeleton” for energy molecules construction. As we know, ATP is our main fuel and increasing its level contributes to more efficient functioning of the whole organism. NADH has a considerable influence on the nervous system health. Enhancing mitochondria functions may already result in a noticeable brain boost and this is not the only mechanism that may aid our thinking processes. NADH is a cofactor in the reduction reaction of BH2 to BH4, BH4 on the other hand, is essential for tyrosine hydroxylase enzyme. This property allows to increase the level of dopamine and noradrenalin, which results in better concentration and higher energy level. The research show that NADH supplementation allows to considerably decrease depression symptoms in case of the majority of the subjects. Satisfying results were also obtained when studying the influence of supplementation on the people with chronic fatigue syndrome. Everyone would like to stay young and beautiful forever. Aging processes cannot be stopped, but by analyzing the changes taking place with age in biochemistry, we may slightly delay physical aging. It was proven that with age, intracellular NAD+ is diminished. It turns out that NAD+ is a strong sirtuin activator, colloquially called a “longevity enzyme”. Therefore, by supplementing NADH, which is oxygenated to NAD+ we may potentially increase also the level of sirtuins, which will allow us to enjoy health and better look than our age indicates. A common problem in the current society is hypertension. One of the ways to lower arterial pressure is increasing the level of nitrogen oxide, which, as a gas hormone, influences relaxation of smooth muscles of blood vessels increasing their light and decreasing tension. Nitrogen oxide is produced from arginine by means of nitric oxide synthase enzyme (NOS). However, in order for such a reaction to take place, the presence of NADPH coenzyme is required, so our supplement should facilitate this process. NADH supplementation may also contribute to lipid profile improvement by lowering the total cholesterol level and LDL fraction. Now Foods NADH should be especially interesting to the people wanting to increase the quality of their lives, boost mood and energy level. It is a pro-health supplement that improves general health and self-being. 1 capsule a day on an empty stomach. Preferably 30 minutes before a meal, drink a glass of water. Turns back time and adds energy. The supplement, which made quite an impression in the West, is also available for us. It improves memory, sports performance, slows the aging process and reduces the signs of depression. It sounds like a fairy tale, but it's all true, supported by many clinical studies. The optimal dose is 10 mg per day, or 1 tablet. To ensure the best absorption is best to take it on an empty stomach, 30 minutes before a meal. Do not increase the recommended dose. Sometimes smaller dose, but taken regularly, works better than the higher doses. From my experience I know that after an hour - two of intake you will notice a definite improvement in mood and increased alertness and concentration, which is why I recommend taking the supplement on an empty stomach in the morning. It can be very helpful in special situations such as exams, important meetings, public presentations. Used by athletes provides greater muscular strength and endurance, shorten the recovery time. 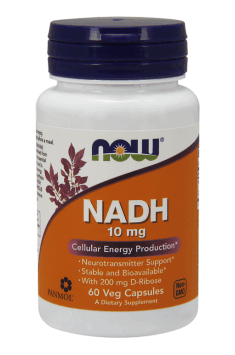 NADH naturally boosts energy, but does not cause habituation or addiction.